The truth about the White Ghost and why Kensi was sent to Afghanistan to hunt him down were both revealed in NCIS: Los Angeles Season 5 Episode 19. Once again, Hetty kept secrets and it ended up to the detriment of her agent. When will she learn that sometimes knowledge is much more important than secrecy? She's repeatedly put her agents in harm's way without providing them important details about their mission. The White Ghost that Kensi was sent to kill never existed; instead, the CIA pegged Jack Simon as the White Ghost as a cover to kill him. Jack was working for them and knew many of the CIA assets in the area, but when he decided to stay and live among the locals he became a liability. I'm not sure why Hetty thought it was a good idea to send Kensi to assassinate the White Ghost, aka her ex-fiance. What did Hetty expect Kensi to do? Hetty's decision would have made more sense if was Kensi was briefed on the true nature of her mission and given guidance about how to proceed once she found the "White Ghost." Also, it's still not clear who killed the previous sniper assigned to the case or why he was killed. While I found "Spoils of War" to be an intense episode that was action-packed, while pushing the characters to new limits, I have an issue with the storyline as a whole now that it's been revealed. I hope we get more answers when Kensi and the team return to Los Angeles. Hetty shouldn't be let off easily by any of them. I doubt Granger will let it go. Could this be the move that does Hetty in? In Afghanistan, the team members were forced to examine their humanity with crucial decisions. Deeks held strong at first. He wasn't going to cross the line to get answers from the Cleric. He withheld sleep and food but didn't resort to torture initially. As someone who was tortured, it was uncomfortable to see him turn into someone who would harm another like that. He didn't pull teeth or cause unbearable pain, but he did waterboard the Cleric. He was emotionally broken by the picture of a "dead" Kensi and reacted from that pain. It was good to see that he quickly gave up that method of questioning. It wasn't in him to do it. He crossed a line, but never to the point of no return. His humanity was intact and that ended up allowing him to see the answer to their problem. 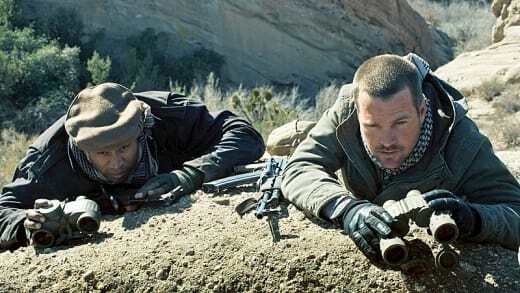 Meanwhile, Sam and Callen showed their own humanity by protecting the young girl helping the Taliban. They saved her and brought her with them as they followed the Taliban. It could have been a costly decision, but ultimately it worked in their favor. 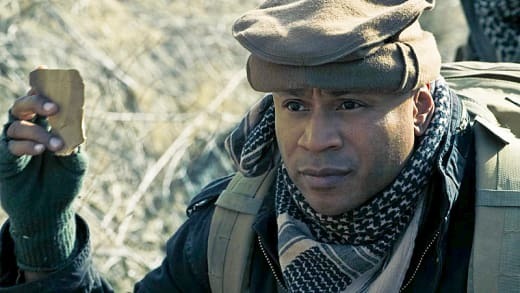 Callen went against Granger and used the girl to keep the Taliban group from heading into Pakistan. Instead, it was a faceoff and the Americans almost lost. Deeks came to the rescue with a hostage exchange: the Cleric for Kensi and Jack. While the NCIS team made the exchange in good faith, the military saw an opportunity to take out their enemy. And, once again their humanity succeeded and they saved the girl from death. The lesson of the hour seemed to be that humanity is lost during war. The NCIS team maintained their own, but it almost cost them their lives. Was the CIA right in wanting Jack dead to protect their assets? Or, were they wrong? Based on the short amount of time we saw him, I'm not sure. Kensi believed in him, but she doesn't really know him now. He thought he found freedom in the Afghan village, but he would always be a threat. I'd like to see more of this story and find out what ends up happening with Jack. Will the CIA let him be? Or, will he be forced back to the US where he can't hurt them? And what does that mean for Kensi? The reunion between Kensi and Deeks was heartfelt, yet Jack was there between them. She couldn't stop looking at her ex even as she hugged her partner. Just as Deeks had recovered from being tortured, she will likely have to do the same. Kensi was Deeks' salvation after his horrific experience. For Kensi's sake, I hope he will be her's as well. Will Kensi and Deeks stay together? Make sure you watch NCIS: Los Angeles Online for more stories like this one!